Ganz Scooby Doo Plush Warner Brothers Stuffed Animal Toy Sitting Dog Pup 8"
Paper Applause Swing, Plastic Applause Swing, Paper Eaton's Price tag & tush tags are attached( paper swing tags have creasing). 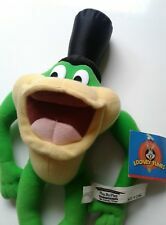 Be sure and have a look around my store for other Plush looney tunes. Tweety Bird in Polka Dot Rain Coat Plush Talks 7"
Wearing a polka Dot Rain coat holding a pink flower press his foot and he says. 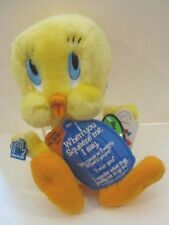 "Have a happy spring time come rain or shine" A Talking Plush. NOTE: batteries in this toy can not be changed they are sewn into toy. Mighty Star tushe tag is attached dated 1991. A Vintage Plush. From top of ears to bottom of toys he measures approx. His tush tags are attached. His ears are bendable and his eyes are plastic. Warner Bros. 1998 Plush Tazmanian Devil wearing Santa Hat with antlers. He is being sold in good used condition. There are no stains or holes. His tags are attached. The paper swing tag has a rip and a crease. Be sure and have a look around my store for other amusment park looney tunes. A Plush amusment park type. Measures approx. 8" tall. His tush tags are attached. He is being sold in very good used condition. Be sure and have a look at my other Warner Bros. Looney Tunes. A Plush beanbag. Designed Exclusively For The Warner Bros Studio Store. Dated 1998. U.S.A Bidders : I have listed air & tracked air shipping. Looney Tunes Year November Mini Beanbag Daffy Duck 7"
Warner Bros. Pilgrim Daffy Mini plush Bean Bag. Be sure and have a look around my store for other Plush looney tunes. He measures approx. 7" tall. Dated 1999. Paper Swing & tush tags are attached. Be sure and have a look at my other Warner Bros. Taz dress in a hippie peace outfit ( not removable) A Plush. Dated 1998 made by Ace Play by Play. From the top of hat to the toes he measures approx. A plush beanbag. Be sure and have a look around my store for other looney tunes. Please Read :Payment:I accept Paypal only and payments are due within 3 days after winning the bid. 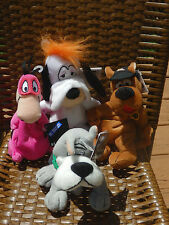 Warner Bros. Be sure and have a look around my store for other Plush looney tunes. Mini plush Bean Bag. Paper Swing & tush tags are attached. Designed exclusively for the. Looney Tunes Year January Mini Beanbag Porky Pig 6"
Warner Bros. New Year's Porky Mini plush Bean Bag. 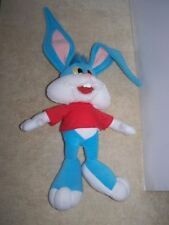 Be sure and have a look around my store for other Plush looney tunes. From the top of his head to his toes he measures approx. Disney The Lion King Simba Plush Stuffed Animal - Disney Authentic 12"
Dress in army coat and hat( not removable) Tush tag is attached and dated 2001. From the tip of ears to his toes he measures approx. 13" tall. NOTE: This toy has been played with the white parts are not as white due to age. Be sure and have a look at my store for other great Taz items. Tazmanian Devil made by. Dated 1993. A Vintage Plush. He measures approx. 9" tall. He is being sold in very good used condition there are no holes or stains. Warner Bros. Be sure and have a look around my store for other Plush looney tunes. Mini plush Bean Bag. Dated 1999 from top of ears to feet he measures approx. 7" tall. Paper Swing & tush tags are attached. 24K Special Effects Division of mighty star. He measures approx. 9" tall. His eyes are plastic, his body is plush, he has suction cups on his hands and feet. He is being sold in very good used condition( just like new). Be sure and have a look at my other Warner Bros. Tweety Bird. Top of his feet are a corduroy material. The bottom of his right foot has his name embroidered. A Plush. Dated 2000. 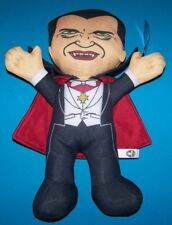 Looney Tunes Year October Halloween Mini Beanbag Taz 5"
Warner Bros. 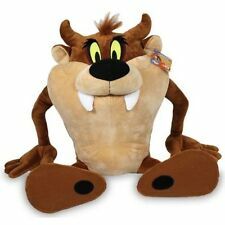 Trick or Treat Taz Mini plush Bean Bag. 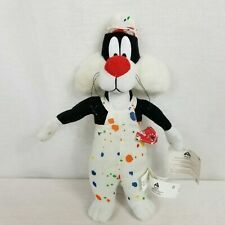 Be sure and have a look around my store for other Plush looney tunes. He measures approx. 5" tall. Dated 1999. Paper Swing & tush tags are attached. This is a Warner Bros. Made by Ganz for sale in Canada. He was a medium size prize won at an amusment park. He has a loop on the back of his head. He is being sold in good used condition. Dated 1998 Warner Bros. He measures approx. 3.25" Tall. Dress as a sailor. PVC/ Soft Plastic Squirter Toy. For Sale. He is being sold in very good used condition. TAZ Tasmanian Devil 1992 Warner Bros. Inc Mighty Star Plush 8"
Tazmanian Devil made by. Dated 1992 Warner Bros Inc. His eyes are plastic the rest of him is plush. He is being sold in good used condition, with lots of play time left to offer.